Liliana is shy at first but will warm up to you given time. She enjoys riding her bicycle, artwork, and playing with her dolls. Liliana has acquired a large collection of dolls. She does not have a favorite food because she enjoys trying new foods. Liliana also has a lot of books. One of Liliana's hobbies is drawing. She enjoys going to church with her family. She likes to listen to music and watch the Disney channel in her free time. Liliana likes dressing up and fixing her hair. Liliana has some challenges in ability to function in areas of daily life, such as communication, self-care, and getting along in social situations. Meet Ezra, Liliana and Adrien! This terrific trio get along well together and enjoy each other's company. They enjoy being active and going on outings or going bike riding. Ezra, Liliana and Adrien also like going to the movies, swimming, and playing video games or watching TV with each other. They all share a deep bond with each other. Ezra is the oldest of the group, Liliana is the middle child, and Adrien is the youngest child. Ezra and Liliana are very protective of their baby brother. As the only boy in the group, Adrien likes to share with his siblings. All three children enjoy going to church. Liliana needs a family who is patient and will demonstrate the ability to implement daily routines on a consistent basis. 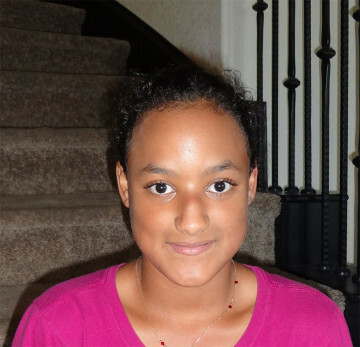 Liliana will thrive best with a loving and supportive family who can provide a significant amount of structure.